Grains weaker in the overnight. Corn down 2 ¼ cents, beans down 4 ¼ cents, and wheat down 5 ½ cents. USDA report from a US corn balance sheet perspective yesterday was friendly. Corn yield dropped to 178.9 bpa from 180.7 bpa. Overall carryout dropped from 1.813 to 1.736 billion bushels. USDA also took into account the recently revised Chinese corn supplies number over the past 10 years. For that time frame they had underestimated corn production each year. When they added in the extra supply, it totaled almost 150 mmt and nearly doubled our world carryout. USDA dropped bean yield from 53.1 bpa to 52.1 bpa yesterday and also increased crush usage 10 million bushels. Overall carryout increased 70 mb to 955 million bushels. USDA increased wheat seeding usage overall 7 mb to drop our carryout to 949 million bushels. They dropped the Australian wheat crop 1 mmt to 17.5 mmt while at the same time slightly increasing the EU crop and leaving the Black Sea wheat production estimates unchanged. 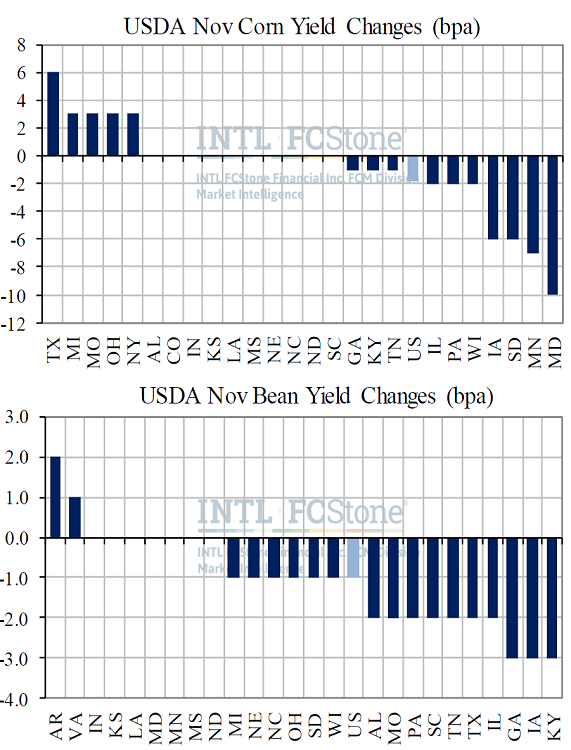 Today’s charts show state-by-state corn and soybean yield changes from the October report to November; the sharper-than-expected national corn yield cut resulted thanks to some sizeable declines in the northern corn belt where wet weather plagued crops both early and late. IA, MN, and SD fell 6-7 bpa each this month. Soybeans lost an even bushel per acre this month thanks to a more widespread reduction in state yields, with 2-3 bpa cuts stretching into the south/Delta/SE.